As with many aspects of life, environment plays a large role in how we view the world. With the making of pottery it's no different. 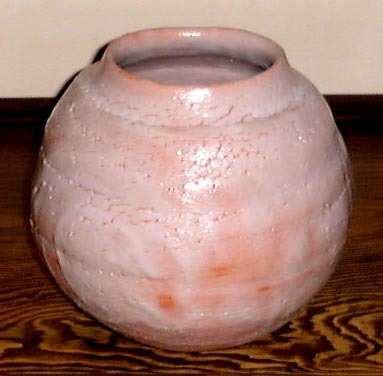 A potter living in the heart of Tokyo cannot make the same kind of pot as one who lives in the countryside. 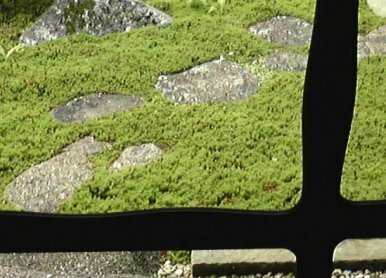 This past week I had the pleasure to visit the home of Mino potter Kato Kozo (1935 - ) in the hills of Tajimi, Gifu prefecture, and I immediately felt this. His studio is set within a forest and also includes a 200 year-old Minka (farmhouse) that was the perfect setting to view his work. 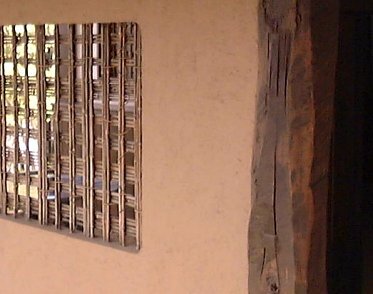 Below is a photo of the wooden partition in front of the majestic house. There was an almost sacred feeling about the whole setting including a fabulous cedar moss garden. His work also imparted to me a divine feeling. Kato is one of only a handful of contemporary Mino potters that understands deep down inside what Mino pottery really is; Mino being the broader name for Shino, Ki-Seto, Setoguro and Oribe. Kato makes all but the latter. For his splendid Shino and deeper than black Setoguro he was named an Intangible Cultural Property for Gifu prefecture in 1995. As he once said, "for me it's Mino or nothing else." Any potter can obtain Mino techniques and that is indeed important. Yet it's only when that technique is mastered and becomes as natural as moving one's elbow that pots become alive. In fact, it's more about the spirit of the potter now than about anything else. Technique takes a backseat. 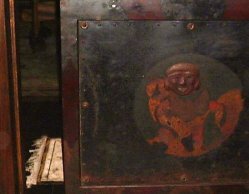 After enjoying some whipped tea in a Ki-Seto chawan, Kato led me to the second floor of the minka where I was greeted by a little jizo-like figure metal piece attached to a solid wooden sliding door. Upon opening the door I entered a room full of Kato's works. Enchanting. The lighting in the room was subdued and made the viewing even more magical. 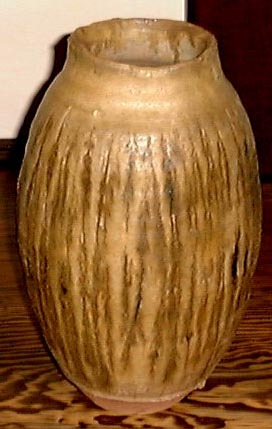 I was particularly taken with this Ki-Seto tsubo-jar with rich amber tones mixed in with the dark yellow 'feathery' glaze. Another magnificent tsubo was this Shino one with its rich crackled glaze with finger wipes and lively hi-iro fire colors. It was gentle like a child and I really wanted to just hold it for a few minutes. This Shino piece had the feel of Kato's teacher, that being the legendary Arakawa Toyozo. Kato's chawan were also splendid and had a quiet sensitivity. 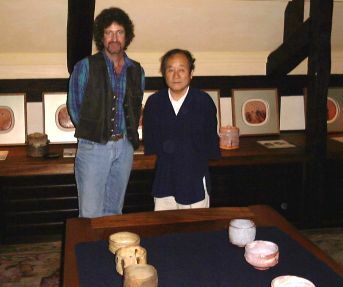 Kato is not a large man and his hands were soft and delicate unlike any other potter's hands I've seen.  The chawan were not dainty in the least though and had a calm strength with full forms. 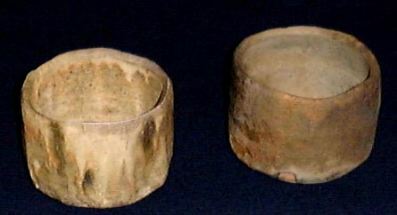 Here are two Ki-Seto chawan. Kato fires in a traditional half underground anagama very much like Arakawa's kiln. 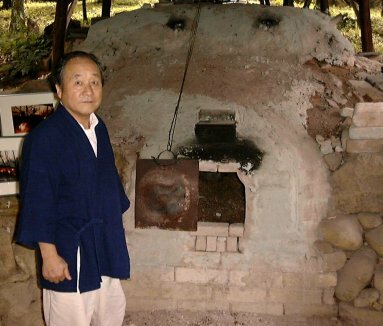 In the photo at top of this page, Kato is standing in front of his kiln. 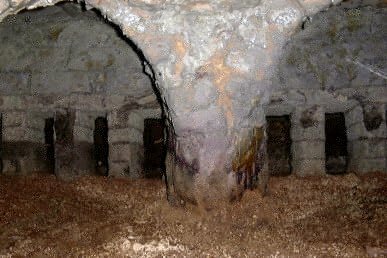 The inside of the kiln is pictured below. Kato fires four times a year and loads about two hundred and twenty chawan (all the Shino ones are fired in saggars each time). Quite unbelievably he is usually only satisfied with about ten chawan and breaks all the rest! Talk about a perfectionist. He tosses the shards into a hole and then covers it over. There must be thousands of broken chawan buried within a few meters of the kiln. 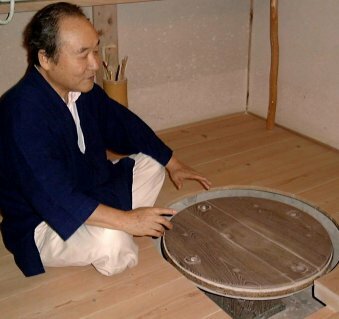 Then it's back to his traditional te-rokuro (hand wheel) where he throws using only the best mogusa and gotomaki clays of the Mino area. 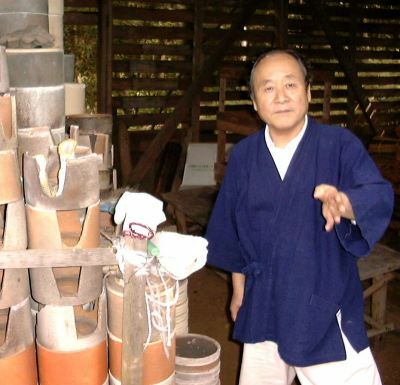 Kato Kozo is arguably Japan's best living Mino potter. His sensitivity to materials and technique along with his supportive environment creates just the right mix for pure Mino to be born. If only the hills could talk and tell others what Kato has learned so well.